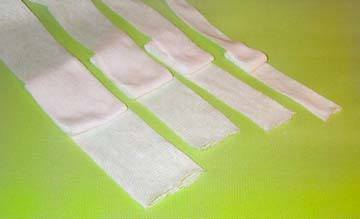 Two kinds of cotton inner head tubing: cotton gauze and cotton stockinette. Note: Weir Doll kits are sized to this tubing, not to the stockinette below. If you are using Weir Doll patterns, we recommend this tubing be used. Stretchy gauze knit tubing for making inner doll heads. For 12" and larger dolls,use a double layer of tubing. 12", 16", 20" dolls will need one yard of tubing per doll (half yard of doubled thicknesss). Need more? Order an entire roll for lowest price. The widths are somewhat nominal. Depending on the roll, tubing may come a little wider, but will still have the same amount of crosswise stretch for the correct doll head sizing. 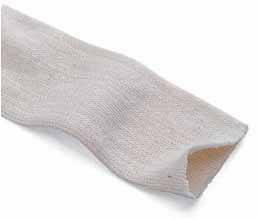 Stockinette tubing is a little heavier and thicker than the gauze above, and you will only need one layer. You will need a half yard per doll.